It’s easy to see why outdoor enthusiasts fall in love with Oregon. Check out this Oregon Public Broadcasting video featuring 8 incredibly scenic Oregon Rivers. (Honestly, I’m not sure how the producers could decide on just 8.) If we add in all the smaller rivers, streams and creeks, it would take you years to explore all the amazing waterways here in Oregon. Included in this video are Chetco River, Illinois River, Metolius River, Deschutes River, North Fork of the Willamette River, McKenzie River, North Umpqua River and the Rogue River. The river’s in bold are all fairly close together and easily explored from the centrally located McKenzie River area. Our beautiful McKenzie River is featured at about 1:20 in the video along with clips of Sahalie and Koosah Falls. Koosah Falls also has a parking area, though it is not as visible as Sahalie’s. As an alternative route to view Koosah Falls without navigating the stairs is to drive down river a 1/4 mile and turn at the Koosah Falls viewpoint. You turn off the highway then turn right to the parking area. There are ramps which work better for strollers. Might be able to do a wheelchair if you have some strong helpers pushing. 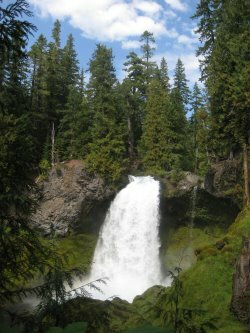 For those who love to hike – my favorite route is to take the McKenzie River’s Waterfall Loop Trail. Its a 3 mile hike that goes around the waterfalls on both sides of the river. So amazing to see the falls from both sides. I have already been to over half of these and now I have a few more to put on my short list of places to visit. If you are like me – you’ll want to visit them all! Are you aware that the Forest Service plans to log many parts very close to the famous scenic Aufderheide Drive in the S. McKenzie River area? I just received email from them and looked at the map of their planned “thinning” which is way too close to that road and the river. Here’s the Forest Service’s link replete with maps of their plans. There will be a 45 day opportunity to comment on this plan. I do hope you will spread the word so as to stop this terrible plan!